Julia B. (Miga) McCarthy, 93, of Venice, FL, passed away on the evening of February 18, 2019. She was a retired clerk for various businesses in the Chicopee Area. Julia was born on October 6, 1925 and was the daughter of the late Walter and Bertha (Czech) Miga. On January 24, 1948, she married, John L. McCarthy and was married for sixty- two years. Julia lived in Chicopee, most of her life, until she moved to Florida in 2015 to live with her daughter, Joan and her son-in-law, Ron. 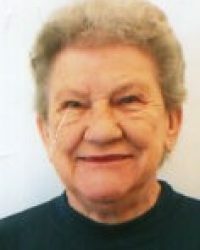 She loved playing cards, games, Bingo and the slots with family and friends. Julia is survived by a daughter, Joan Buckley and her husband, Ron, of Venice, FL, a son, Robert McCarthy and his wife, Denice, of Sandy, UT, a daughter, Mary Ruggiero and her husband, Rod, of Belchertown and a sister, Genevieve “Ginny”Park. Julia was the loving grandmother to Sara, Stacey, Amy, Jonathan and Shauna and great grandmother of 7. She is predeceased by her husband, John L. McCarthy, brothers, Henry, John, Edward and sisters, Helen, Jane and Stefanie. Julia’s funeral will be held on Tuesday, April 2, 2019 from the Cierpial Memorial Funeral Home on 69 East St. in Chicopee Falls. A Liturgy of Christian Burial will follow in St. Anne Church, 30 College St. in Chicopee at 11 am. Burial will be in the Massachusetts Veterans Memorial Cemetery, 1390 Main St. in Agawam at 1 pm. Family and friends can visit at the funeral home on Tuesday morning from 9:30 to 10:30 am. In lieu of flowers, donations may be made in her name to Tidewell Hospice, 1250 N. Access Rd., Port Charlotte, FL 22981. Copyright © 2019 Cierpial Memorial Funeral Homes | Website by Bloo Solutions, Inc.